It is widely acknowledged that many of us are deficient or have sub-optimal levels of Vitamin D and in the past few months more research has been hitting the news supporting this theory. Exposure to the sun stimulates vitamin D production in the skin and it is available from certain foods and also supplements. A simple blood test can in fact determine whether there is a deficiency in the blood and, if this is found to be the case, you can increase your levels by making sure you include foods in your diet which contain Vitamin D and also by taking a supplement. 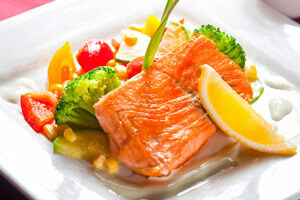 • The following foods contain vitamin D; herrings, mackerel, salmon, oysters, cottage cheese and eggs. • However, food manufacturers often fortify foods with Vitamin D so always check the labels; foods such as milk, breakfast cereals, yogurt orange juice and margarine. • It is also possible to increase Vitamin D levels by going outside more. About 15 minutes of sun exposure (without sunscreen) is usually enough to build up levels. However, several factors can influence the amount of sun exposure you get including the time of year, cloud cover and the time of day (the sun’s rays are more direct during the middle of the day). Sunscreen is still very important to your health so please note that if you are going to be outside for longer than 15 minutes in direct sunlight then you must wear sunscreen to protect against the sun’s damaging rays. This is the main reason why a Vitamin D test is always recommended before taking any supplementation, even if you believe you are suffering from any of the symptoms above. Please contact Alyson on 07816981858 for further information regarding the test.